Also known as bacterial blossom, bacterial bloom is a condition in which a sudden increase in the number of bacterial colonies occurs, specifically bacteria that are suspended in the water column. The bacteria grows so rapidly that collectively they become visible to the naked eye, causing the water to become cloudy or milky in appearance. Sometimes the blossom is so severe it is difficult to see the fish. 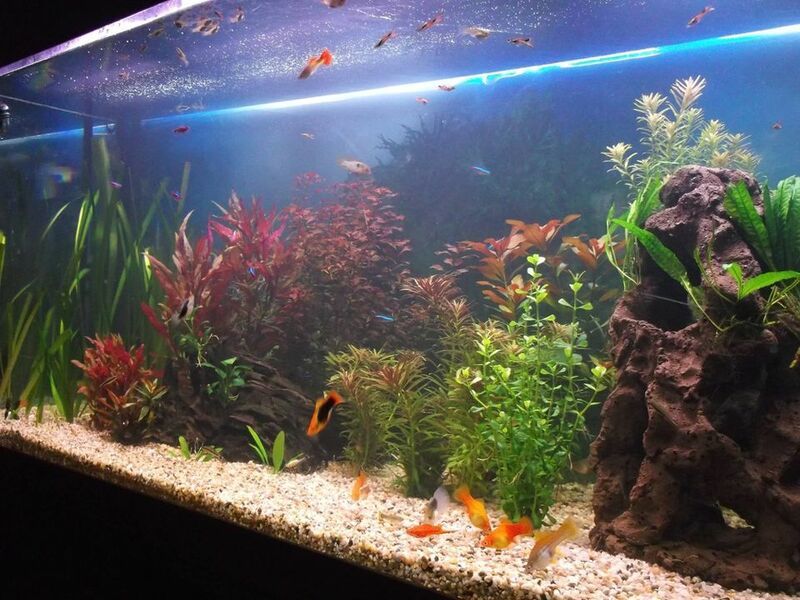 This condition most often is seen in a newly started aquarium, but can also occur in a tank in which there is has been an increase in the nutrients in the water, particularly nitrates and phosphates. This can happen if fish die and are not promptly removed, or if plants die off and are not removed. Excessive feeding of fish without cleaning the debris can also cause a sharp increase in nutrients that result in bacterial bloom. Autotrophic Bacteria - Bacteria capable of synthesizing its own food from inorganic substances, using light or chemical energy. The beneficial filter bacteria are autotrophs. Heterotrophic Bacteria - Bacteria that cannot synthesize its own food and is dependent on complex organic substances for nutrition. The heterotrophs in the aquariums mineralize the organic waste (break down the uneaten food, fish waste, dead plant matter, etc. into ammonia). It is more common that the heterotrophs are seen in bacterial blooms, not the trusted autotroph nitrifiers. It is the heterotrophs which are primarily responsible for creating the "bio-film" (slimy residue found on the tank walls and ornaments) which builds up in the "new water" aquarium. The heterotrophs are generally bigger than the autotrophs and therefore don't attach themselves to surfaces with the same ease. They also reproduce much more quickly. Heterotrophs can reproduce in around 15 to 20 minutes, whereas autotrophs can take up to 24 hours to reproduce. In a newly set-up aquarium, the heterotrophs get to work quicker than the autotrophs, causing the 'cycling bloom' so often seen. Blooms are almost certainly heterotrophic if they are caused by a build-up of organic waste in the substrate, which most, if not all, are. Most of the bacteria in the aquarium are aerobic, as it is an oxygen dominated environment and these bacteria require lots of oxygen. When the heterotrophic bacteria bloom into the water column and switch to their aerobic state, this is a big drain on the oxygen content of the water. Oxygen deprivation is the only risk to the fish during a bacterial bloom, as the heterotrophs themselves are harmless to fish. Fish may be gasping for air at the surface of the water during this part of the nitrogen cycle, so good advice is to increase aeration! Why do bacterial blooms occur? The main reasons: Overfeeding, dead fish or dead plant matter will cause a rise in the reproduction of the heterotrophs in order to break down the organic waste, they reproduce too quickly to be able to attach themselves to a surface and this causes a bacterial bloom. As the ammonia production increases due to the increased mineralization, the nitrifiers are slow to catch up and an ammonia spike occurs until the autotrophs reproduce enough to take care of it. Contrary to popular belief, bacterial blooms cause an ammonia spike, not the other way around. Regular partial water changes and good tank maintenance will usually prevent severe bacterial blooms. In new tanks, the bloom will dissipate as the nitrogen cycle becomes established and stabilizes. Which Lighting Is Best for a Well-Planted Community Aquarium?